Check Store Management section for more information on store creation and configuration in your myPOS account. 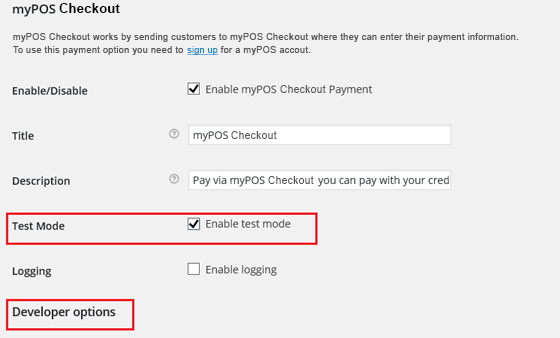 In order to configure values of myPOS Checkout in the setting page go to WooCommerce > Settings > Checkout/Payments > myPOS Checkout. Then you need to enable the myPOS Checkout and Save changes. You may enable logging in order to have reports saved to your store, which helps diagnosing errors quickly. Check Store Management for more information for the following parameters. a) Store ID - it is given when you add a new online store. *Make sure thare are no extra spaces or a new line before and after the "-----"
5. Save Configuration Changes by clicking on the “Save changes” button. Once myPOS Checkout is configured your customers will be able to choose it as a payment method and pay for your goods and services easily and secure using Debit/Credit card or iDEAL. iDEAL is an e-commerce payment system used in the Netherlands, based on online banking. Therefore this method is only available to merchants operating in the Netherlands. You can configure whether to show only card Payment, iDEAL or both options to your customers. If iDEAL is selected your customers will be brought to a simple checkout page where they can select their bank. If "Card Payment" option is selected your customers will be redirected to a simple checkout where they can enter card details. If option - "All" is selected during Checkout your customers will be able to choose between the two payment methods.